…and Epsom – what’s wrong with you people? They where told how to vote. True, though for whatever it might be worth, Barry Humphries in a 1980s interview was moved to mention how he'd been struck by an overwhelming sense of sadness while driving through Epsom after dark. The existential hell of the grammar zone? So real outsiders breaking in: none. Have I missed any? The 5% threshold seems, to me, like a statement that we don't want to risk any weirdos whom we don't know getting in. Only the people entitled enough to be there, thanks. The likes of TOP and Conservative have demonstrated it's an extremely hard ceiling to break through. Even with the resources and (often) the apparent sympathies of many voters, many people simply won't vote for a party they see as at risk of not reaching the threshold, presumably(?) because they want to feel like their vote's counted for something. If he threshold was 1% more people would vote for those minor parties BECAUSE their vote would count. Same applies to a transferable vote system. But it won't happen because those votes would come from National and Labour and they won't allow such a change to be made. The reactions to the review in this article really highlight that attitude. Labour "backs the changes", but only makes a deal of getting rid of coat-tailing (something that National's been taking lots of advantage of lately to foster coalition partners). National opposes lowering the threshold (no reason given). Greens support the proposed changes entirely. NZF doesn't support lowering the threshold. I think I'd need to be convinced about lowering the threshold as far as 1% for similar stability concerns expressed by the Chief Electoral Officer, but right now it definitely seems much too high. But I also hate the idea of people whose votes get obliterated by the system, after the count, not having an opportunity to reassign them. Has a transferable vote idea ever been seriously considered under MMP that anyone's aware of? Even If Labour and the Greens had been given a mandate to govern without NZ first, that’s not change. That’s more or less the same government we already had, but with much more capable professionalism. Steven, that really isn't true. A Labour-Green government would have been (will be next time?) markedly different, in a vast number of policy areas. Not just different from National, but from Clark 2002-08, when the Greens were on the outer. Didn't they metamorphose into The Greens? That has to be a plus! Yeah, kind of, via the somewhat misnamed Alliance. And it has continued to evolve since. As of last term there was as much ex-Macgillicuddys as ex-Values in the Green genome. Actually, not sure steady genetic inheritance is the best image for it: the progress of the core personnel and ideas over decades has been more like a rolling maul. Meanwhile we can enjoy the Blue-Green coalition fantasies being circulated on social media. Possible motivations include blatant mischief-making, genuine fear of Winston destroying the Nats yet again, the prospect of Ron Mark ("Go back to Korea!") sitting next to Melissa Lee with 3 years of the government saying "we're not racist but ...". Oh, and we can't rule out simple delusion, where the environment is miraculously saved and nobody has to pay for it at all. I'd love James Shaw to say "OK National, let's talk, but first you have to gift us an electorate, because this deal will kill us otherwise. So who's it gonna be?". The National party ain't much like it was in the 70's either, and Labour even further away. They just never changed their names, even though a few in National used to fly other colours. True that; I could countenance voting for 1970s Labour. The Greens didn't need to align with National in order to recently bring them to the point of extinction. That was with an MOU with Labour. With MMP it's just that smaller parties have been at the mercy of the larger ones. Although Peters has been with both National and Labour and he's still around and look at how much power he currently has. It's unlikely the Greens will wield such influence. Or in other words, any National deal's a killer, electorate gift or no. That's taking a shortsighted view. The Greens have a political identity that can survive individual members' careers. Winston personally has a strong political identity, but NZF, not so much. You've previously mentioned the upcoming succession problem: Shane isn't Winston. I agree the Greens have a special character. But that does mean they lack leverage. It seems to me there's an element of the electorate punishing small parties for trying to do the achievable and not hang out for the unlikely. The Maori Party had a number of impressive achievements one of which, Whanau Ora, has been adopted by Labour and would not be there if not for the MP. 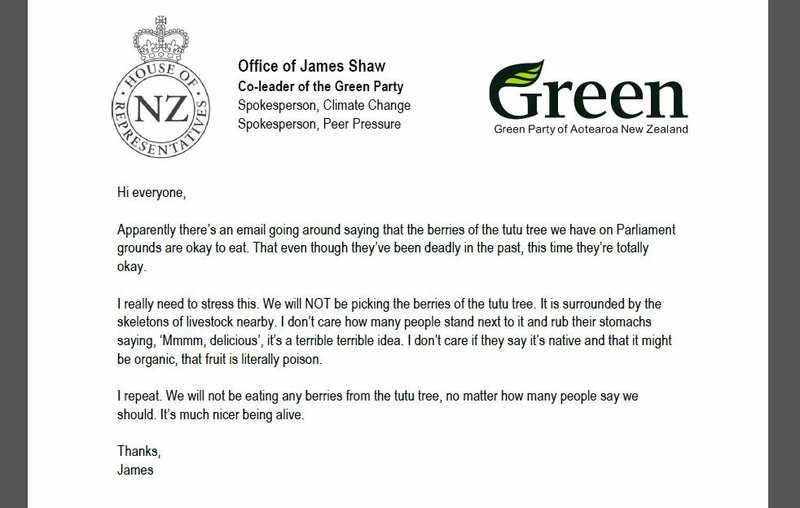 The Greens have so far been fairly adept at maintaining their own independent voice (and James’ communique clearly shows they do recognise the potential problems). I don’t know if it’s “the electorate” punishing the minor parties though, so much as that the major parties still haven’t fully accepted that they need to cooperate with rather than compete with them, throughout the term and during the election cycle. Nurturing a minor partner is much more than lifeboat deals (offered, you’ll note, when they advantage the partnership rather than the minor party alone): it’s about allowing them the freedom to have an independent critical voice and to maintain a clear stance in the media, and giving explicit credit when adopting their policy initiatives. The majors have an unfortunate tendency to see minor parties as nuisances to be used when needed and tossed aside when that’s no longer the case. So in a way the Greens have been fortunate to have been largely excluded from government so far; and Winston has survived by not letting himself get walked over, and thereby maintaining his own singular voice. The intricacies of Common Knowledge. Everyone knows that everyone knows The Greens won't go with National. Everyone knows that no one knows what Peters will do. Taken at face value it provides reasons to assume he'll be favourable to the Labour/Greens option. May seem a tad naive to assume he means what he says, but I'm inclined to regardless. I suspect he's now primarily motivated by the need to create his legacy. Provided Labour pull finger and transcend their sectarianism, a new government designed on common ground is feasible. I'm confident James and Jacinda have the goodwill and intelligence required to produce a suitable outcome. I'm not confident that Winston is sufficiently adept to yield to the public interest when necessary. He probably has a sense that the win/win/win three-way coalition is possible, and I bet his bias against the Nats is so strong now that he won't repeat that mistake from 20 years ago willingly, but being stubborn and holding out for all his bottom lines could yet be the character flaw that denies him an exceptional legacy. Isn't this whole perceived Winston dilemma a hangover from FPP days? As a population, we're still in a collective mindset of wanting big parties to run things, but that also means that we end up with giant blobs of parties that aren't allowed to mix. If this is what those voters want then whatever. It has its advantages, but under MMP it also means that every time there's no absolute majority (ie every time so far) there are very few minor parties around, to negotiate with. If National, however, were really 2 or 3 separate parties that people could elect according to the lines they preferred, it's more feasible that one or two of them might even be able to fit with Labour, or even the Greens, and form a decent government. Labour shrank a while back and many who might have been Labour voters previously are probably now established Green voters, or at least content to switch between the two depending on various factors. Voters in that area get to influence what they want their side to look like. National doesn't really do that, though. Differences all stay behind closed doors and are handled within the party, and there's just a brick wall for voters to throw their votes at. It's this obsession with having large controlling parties, which can't practically mix, that makes someone like Winston the centre of attention. Everyone hoping to form a government has to deal with him, even though few really like him around except the 1/13th of voters who elected him. News hub Reid Research poll *reputation intact* .Hats off to them for picking up on the early trends. One of the weirdest things about the discussions of who will form a coalition with whom has been the idea that it's a bad thing for one party to have to compromise. But compromise is good, we teach our kids to compromise to reach a consensus solution to a problem, we reach compromises in business and our day to day jobs. Compromises are about recognising that some things are very important to other people and other groups. Surely we want our representatives in parliament to understand compromise and work towards achieving a government that can make appropriate and fair compromises. All the talk of bottom lines and lines in the sand is just childish (looking at you MSM). For balance - or to fill up a slow day while we wait for specials - here is the most detailed and sort-of plausible list of National-Green policies that I've seen so far, if the impossible coalition happened. Lance says that he voted/supports Greens, so it's not just Nats playing silly buggers (which most of this chatter has been). I voted Green too, and I'd settle for that list. Yeh, nah. National might be desperate enough to offer a deal, but Shaw is very clearly minded to suggest they investigate the invigorating possibilities of a hilltop ramble. But that's the narrative National shills want - we're so reasonable, it's only Shaw and his stubborn lefties who are stopping a green dream. It's BS, and he plays into it. Call their bluff, I say. Do it with the same concern-trolling that they're doing to the Greens. ("I believe Bill English is privately open to a pollution tax, even though he said he opposed it before the election, and I'd love to have a chat with him about it"). Then watch him squirm. If National offers a deal then I think it'd be largely so it can claim to its supporters that it tried, and that it was the Greens who were being unreasonable, the Greens' fault that NZ First is inflicted upon everyone, and yadiyadiyada.